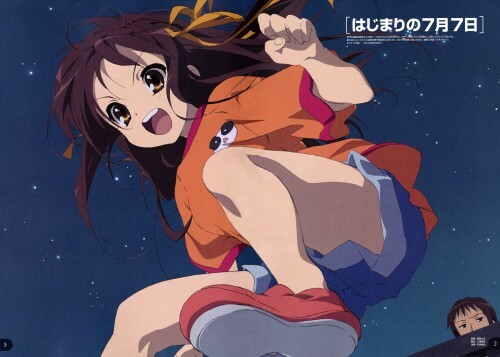 haruhi looks a bit younger in this scan~! kawaii! thanks for sharing! Still wondering of when will the second season be produced. Always so energetic....Haruhi is the best! Her pose is awesome! Thanks so much for the upload. I think that she is quite pretty! Never knew this exist. Thanks! Haha, Kyon on the bottom right corner of the picture. Oh Mini-Haruhi and Kyon in the background!